:-)First I would like to say I am pleased with the amount of TALENT and HELP this form has to offer. :? : My problem is when I plug in my USB cable to my FZ-20 I get a warning "a USB device has malfunctioned and exceeded the power limits of its hub port" My FZ-1/v2 and FZ-10 work fine. I tried reset and changing the USB mode to pictbridge then back to PC still not working I can read the card if I put it in my FZ-10. I am heading over to camera shop to try a different cable since it is smaller than FZ-10 cable. Have had this baby for 10 months. sounds strange. Maybe try it on someone else's computer. A card reader is faster and saves time plus wear and tear on the camera. I'm not sure what's up, but be careful you might damage the camera. This is a Panasonic customer service question for sure. Never heard of anything like it. Went to camera shop pluged camera into their PC their PC shut down and the cable got hot and end started to smoke, not good looks like a trip to the repair shop. Please let us know what the final result is. I came across this thread through a search, I am having the same problem with the same message. It has worked fine until now. The USB port is shorting out. Camera has to be sent in to change the card. Camera works perfect just have to use card reader. They say two week turnaround but I need camera this weekend so I haven't sent it away yet. 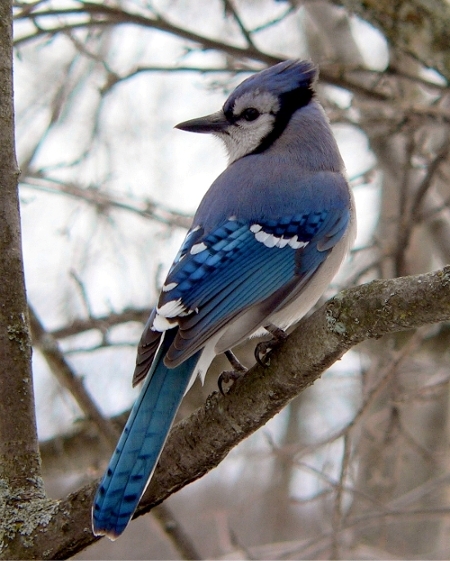 Awesome blue jay! I love those birds. I also vote for the card reader. I actually have a Western Digital external hard drive with the card reader built in. It takes almost all cards, which is great b/c I have three different types of cards, and i will have a compact flash card that will need reading. Download everything to the drive and then when I travel I usually take the drive with my laptop. But you can get a $20 card reader which will do the trick. which WD hard drive do you have? Thanks alot for the info. I guess I will break down and get a card reader myself. I am not about to give up the camera for two weeks for the sake of thirty bucks. I am going to Tofino in two weeks and should have some awsome photo opportunities. Juts got to get good enough to take advantage of them:-). Hello - I found this thread using search but I just ran into the same problem with my FZ-15 today. Am I interpreting that the best and cheapest way to get around this issue is to use a card reader instead of hooking up the camera directly to the PC? Is it a cable issue or an issue with the camera itself? I tried reseting, rebooting, etc. Even with the camera turned off, the minute I plugged in the USB to the PC, I got the same surge warning too. What a bummer, such a great camera otherwise!